On The Fenway Pub Crawl, you'll visit 3 baseball bars and a local brewery in the shadow of Boston's Fenway Park with an expert guide. 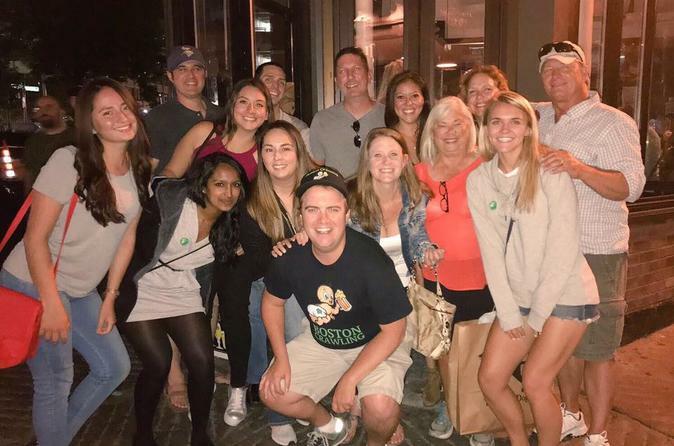 From the baseball novice to the Red Sox expert, our Fenway Pub Crawl will entertain and enlighten. Spend 2 hours and 15 minutes enjoying local Boston brews and hearing unknown tales of the history of baseball in Boston, our beloved Red Sox, and the building of the ball park you're walking beside! The Fenway Pub Crawl tours begin outside Fenway Park at Gate E on Lansdowne street. It's not necessary to bring a physical copy of your ticket-- if you have your ID and a smile, you're ready to join your fellow baseball and beer lovers for a day of history and brews! From Gate E, your expert guide will lead the group to 3 baseball bars and a local brewery in the shadow of Fenway Park. Throughout the tour, your guide will entertain you with unknown tales of history of Fenway Park, the Red Sox, and baseball in Boston. At each stop you'll enjoy local beer and the company of fellow travelers from around the globe. All the pubs are located near each other on the streets surrounding Fenway Park, however it is a walking tour so leave the heels and cleats at home!